Last weekend, a monarch was feasting in my backyard. As I sat outside watching her flutter around the flowers and amidst the bees, I noticed several other monarchs catching air currents just above the treeline. These butterflies are preparing for one of the most astounding migrations on the planet — one that is longer than any other butterfly in the world. Monarchs starting in the northern regions of the U.S. and even into Canada will be traveling to winter roosting sites in the mountains of Mexico. There are also smaller populations of monarchs west of the Rocky Mountains that migrate to roosting sites along the California coast. These great grandchildren (!) 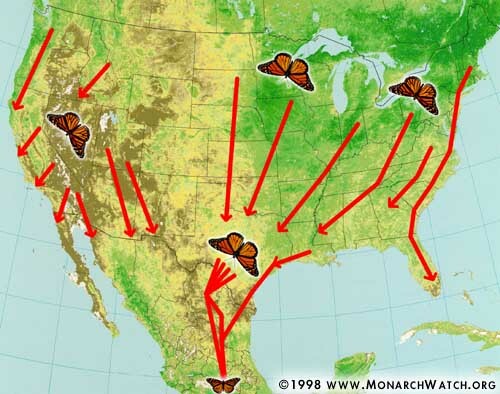 of the monarchs who made their way up from Mexico in the Spring often return to the same area that their great grandparents left. Put another way, in Spring, monarchs leave their roosting sites in the mountains of Mexico. They fly for awhile, decide they like the flowers in the Southern U.S. and they make caterpillars. When these butterflies emerge, they travel northward, making it to the central U.S. Another set of butterflies emerge and travel northward again. Their offspring notice that the days are getting chillier and that the sun is setting lower on the horizon. Somehow, it’s these young butterflies that know it’s time to head south for a Mexican vacation to escape the northern winter. It is still quite a mystery as to how these butterflies are able to return to their roosting spots 1000s of miles away. In an effort to understand these migrations better — both in terms of understanding how the monarchs complete this feat, and in seeing how monarch populations are dealing with habit loss, herbicides killing their host plant, and climate change — the program Monarch Watch was conceived about 20 years ago. One of the primary programs of Monarch Watch is tagging. 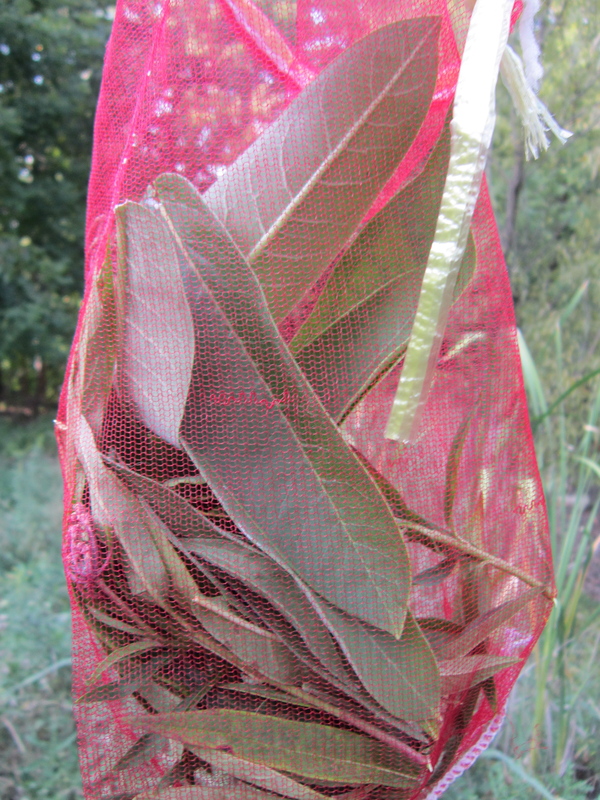 Monarchs are quickly caught in a butterfly net, a small sticker with a unique code is placed on their wing, and they are released. Later, people are hired in Mexico to search through thousands of butterflies to locate these tags. By matching these tags with where they were originally placed on the butterfly (for example, in Cleveland, OH), scientists can better understand the monarch migration route (more on this in part 2). Monarch Watch also has resources to help people rear monarchs. This makes a wonderful project for kids (and adults!) to get a first-hand experience with the life cycle of a butterfly. Additionally, the resulting butterflies can be tagged and sent on their merry way to Mexico. 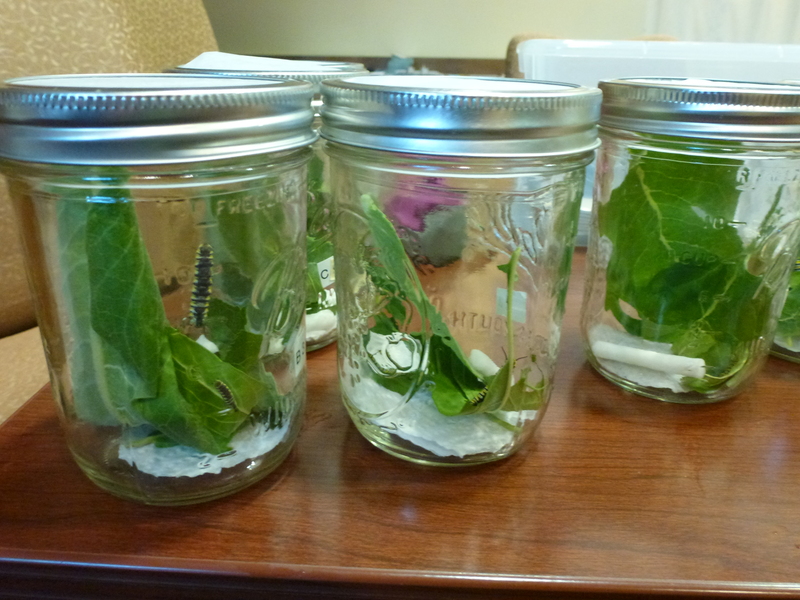 As part of a monarch educational program that I’m helping with at work, we ordered monarch larvae that we’ve been rearing and will tag with visitors before letting the butterflies head south for the winter. Monarchs go through several changes of their skin before they become the fat caterpillars that have enough energy to become a chrysalis. 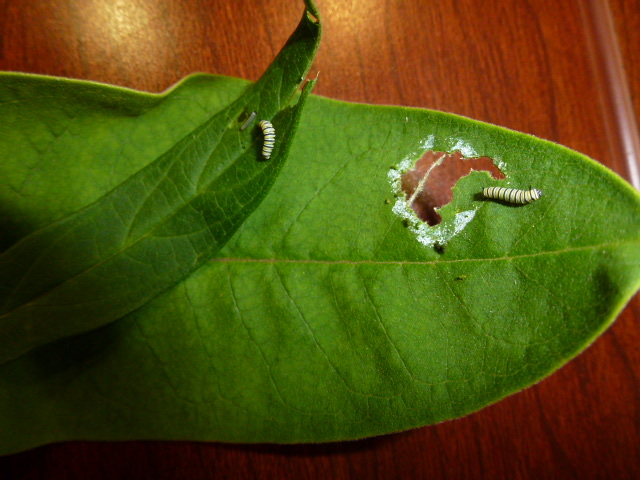 We first received larvae that were between their 1st and 3rd instar (changing of their skin). They came three to a small cup. The larvae started out very small. 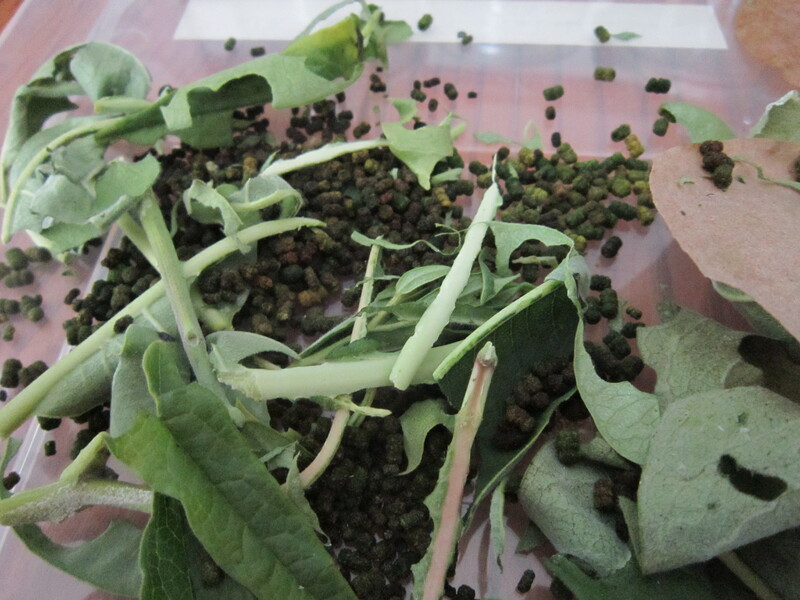 We quickly provided them with the only plant monarch larvae eat, milkweed (although there are quite a few varieties!). 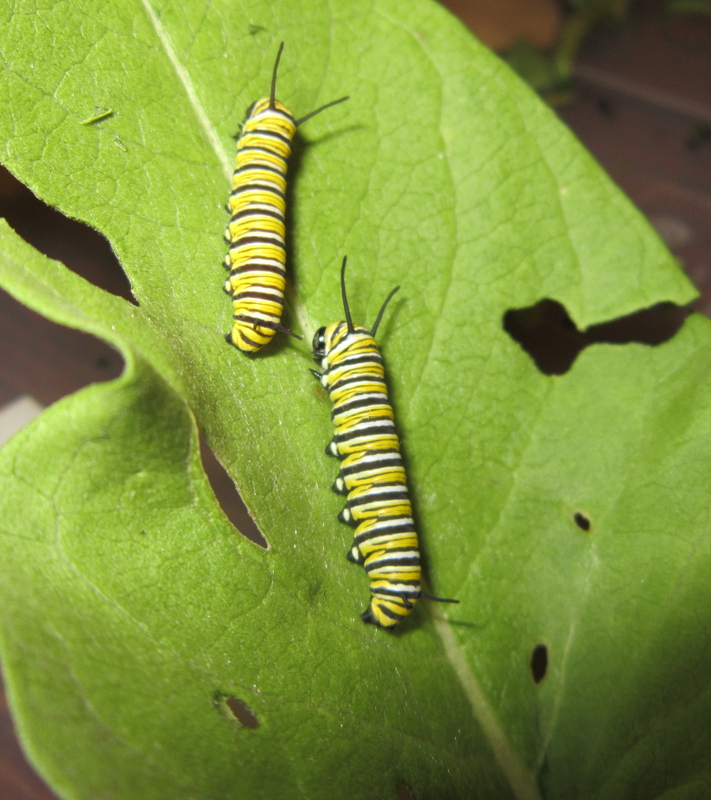 Milkweed contains a toxic compound that makes these caterpillars and butterflies poisonous to other animals. A bird need only eat one of these bright orange butterflies to know it should never do so again! 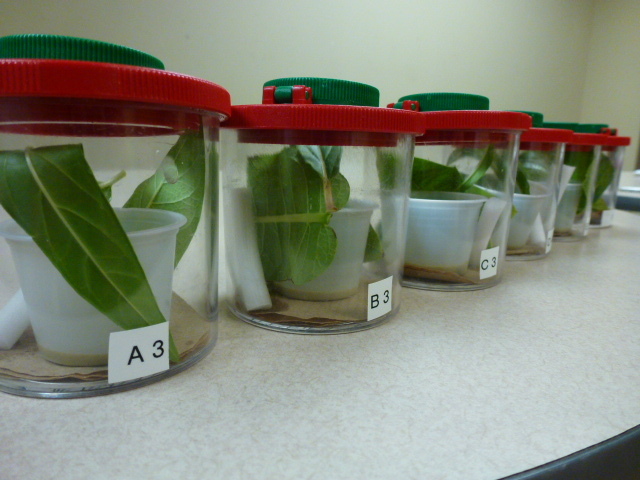 We placed each set of three in their own bug jar. Monarch’s first home. 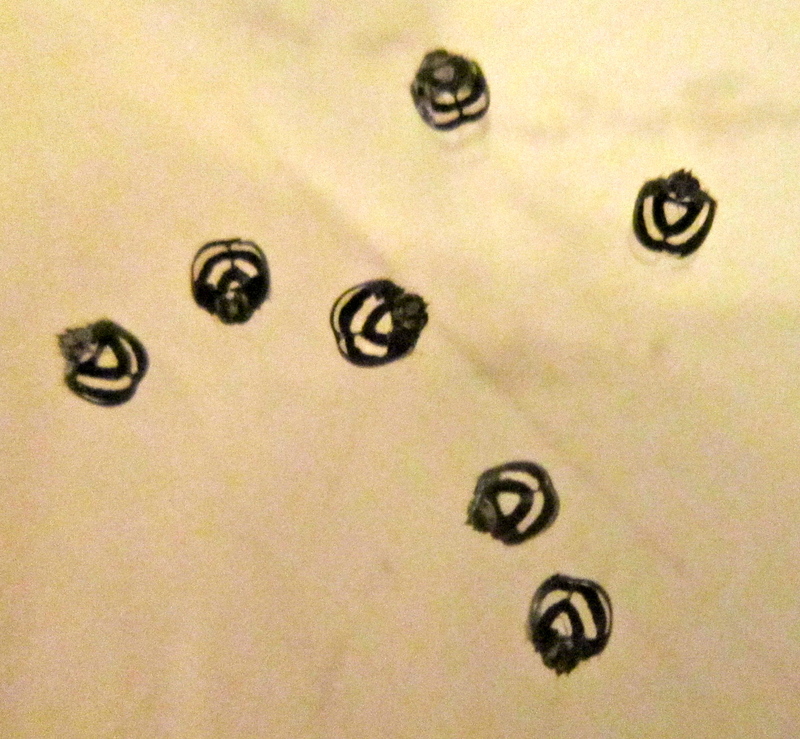 (The little cotton swabs were dipped in water to help hold in a little humidity). They started consuming the milkweed voraciously and outgrew these containers quickly! 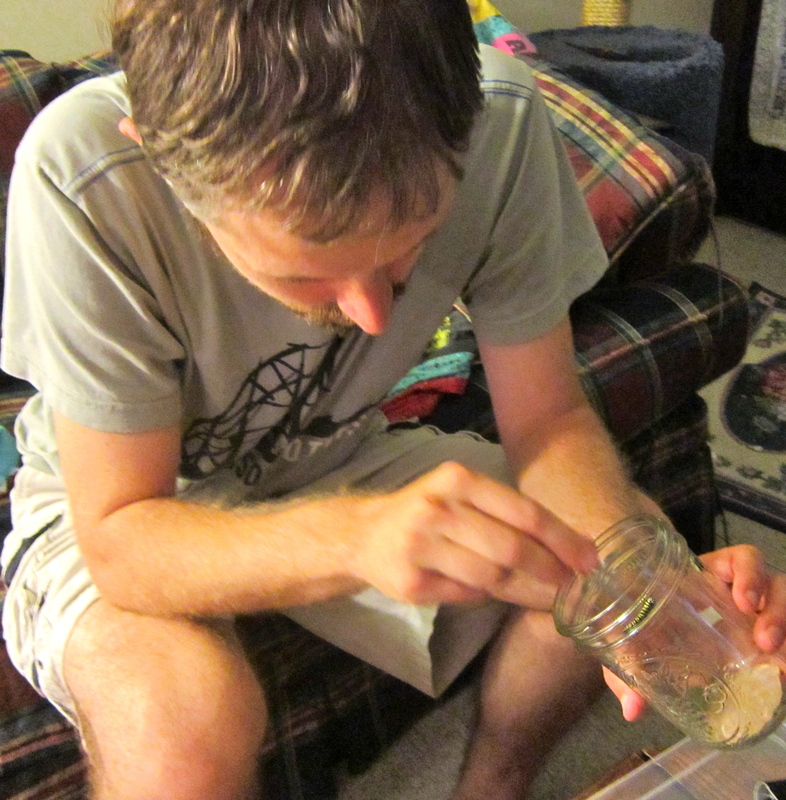 We moved them to Ball jars and used a breathable material in place of a regular lid. Over the next week, they continued to eat and grow. Their houses needed to be cleaned every day. A fun activity for the young or youngish! All of that milkweed comes out the other end! Who knew they could poop so much! In addition to their obvious changes in size, sometimes when we cleaned out the containers we found evidence that they had shed their last skin. These are all face caps from their previous bodies. And soon it was apparent that these caterpillars couldn’t get very much bigger. I was feeding them fresh milkweed twice a day! One night before I went to bed, I noticed one of the monarchs hanging from the top of its jar by its hind feet. This is the classic “J” shape they go into during their last stage as a caterpillar. It was still like that in the morning, but it’s antennae were beginning to look very withered. Still, it didn’t seem to be doing much. I stepped away for a few minutes (less than 10!) and came back to see this! 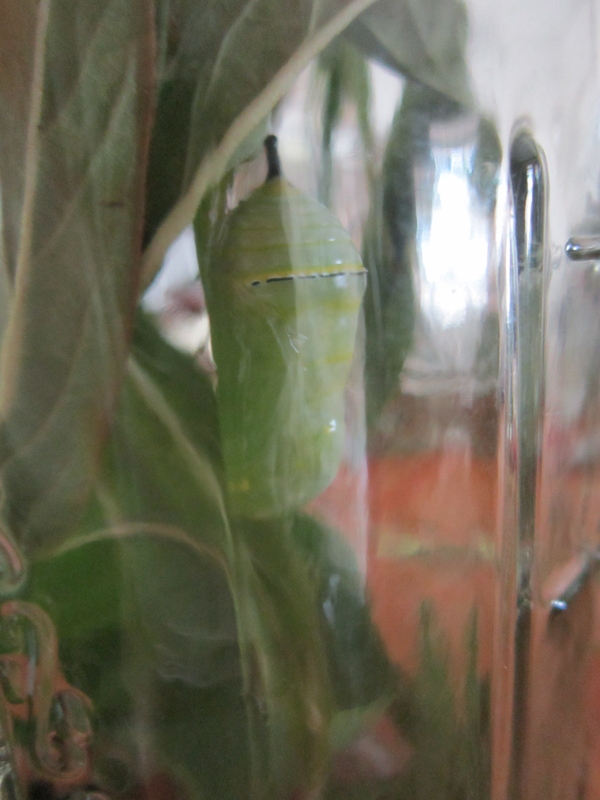 Monarch chrysalis in Ball jar. I felt so excited that I got chills! What an amazing transformation! And it seemed like magic to shed one skin and be left with this beautiful chrysalis. Since the monarchs need something rough to grab on to when they emerge, I took the advice of Monarch Watch and moved the chrysalises to emergence chambers (24 hours after the chrysalis appeared). I (very carefully!) 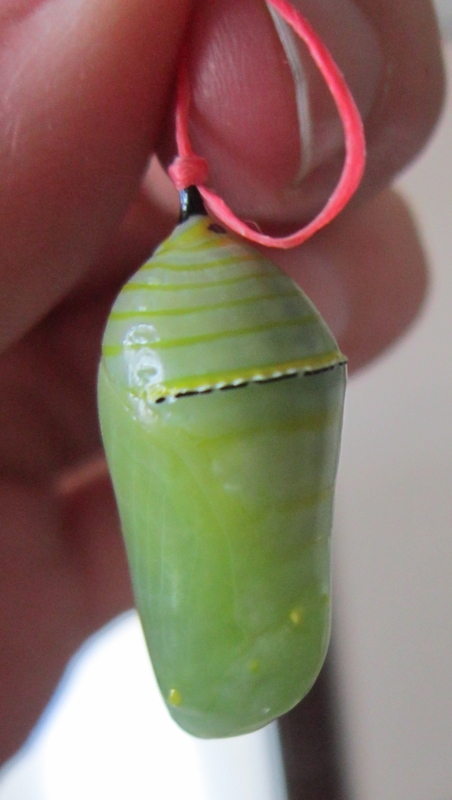 tied a string around the tip of the chrysalis and removed the tip from the branch it was attached to with forceps. Emergence chambers are easy to construct out of 10 oz. plastic cups lined with screen. 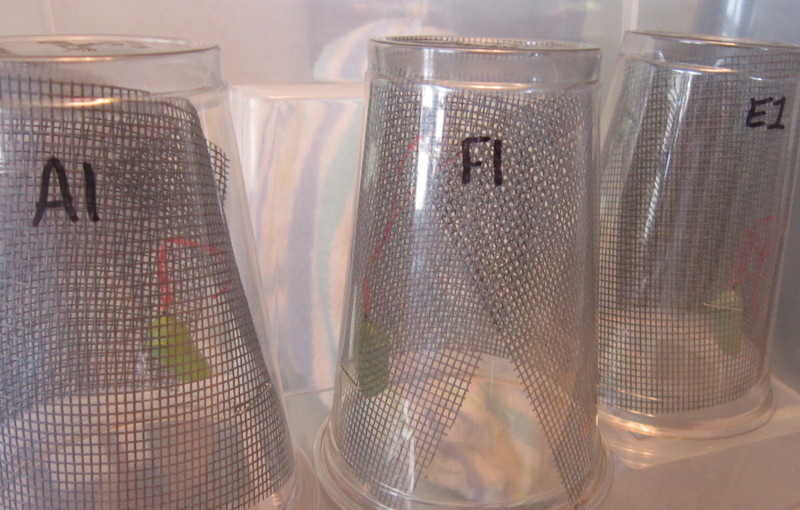 I put a small piece of tape on the string and attached it to the screen inside the cups. Over the next couple of days, the remainder of the caterpillars rapidly started becoming chrysalises. 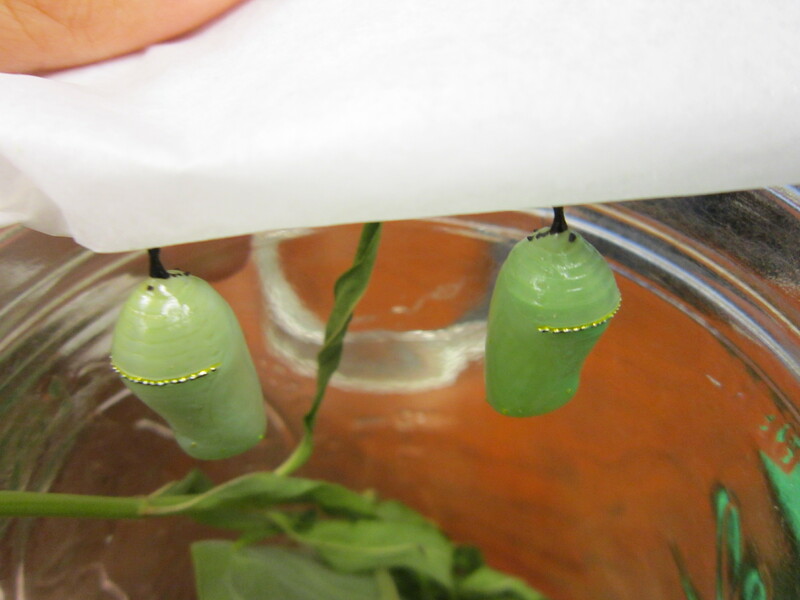 Each was put into an emergence chamber 24-hours after it became a chrysalis (they need some time to harden). Now we wait to see what happens! Shared on Eat Make Grow, Your Green Resource, and Real Food Forager. We have been doing this for about 5 yrs now as well. This was fun to read and look at your pictures. We are able to catch our Monarchs wild and this year has been hard on them. We are dealing with some parasitic fly that is laying eggs in some of the young caterpillars. Hopefully the ones we have now will make it all the way to butterfly and we will enjoy releasing them. Thanks for sharing! It really is rewarding to go through this process, and it must be very difficult to see some of the young infested with parasites. I hope the remainder make it and you can enjoy releasing them! Wow – this is so neat. I think I’d like to do this. Thanks for such an informative and fun post. I’m glad you enjoyed the post! I hope that you get to try this sometime…it is really rewarding! You should also try Swallowtails. They winter over, have a (alright let’s be honest) ugly chrysalis, but turn out so beautiful in the spring. They eat carrrot tops, Queen Anne’s Lace and other herbs. 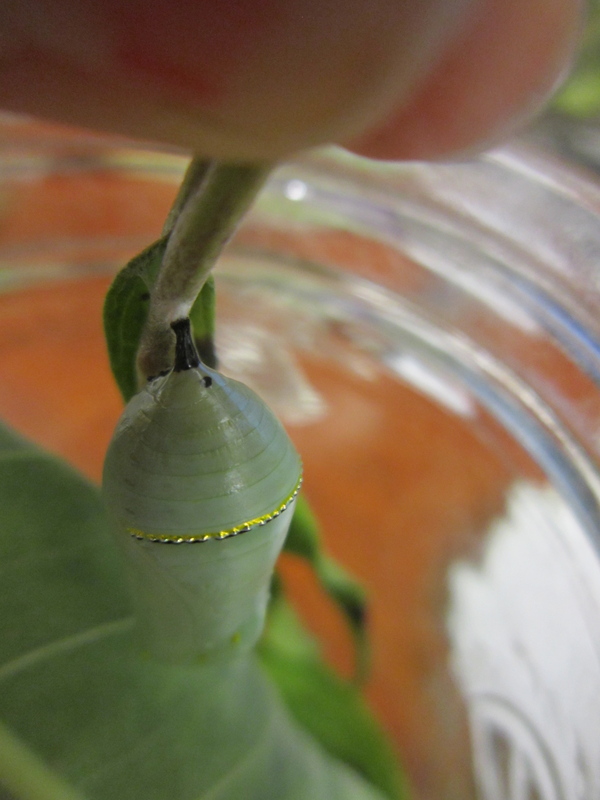 Where do you keep the swallowtail chrysalis’ overwinter? Ooo! This is a good idea! 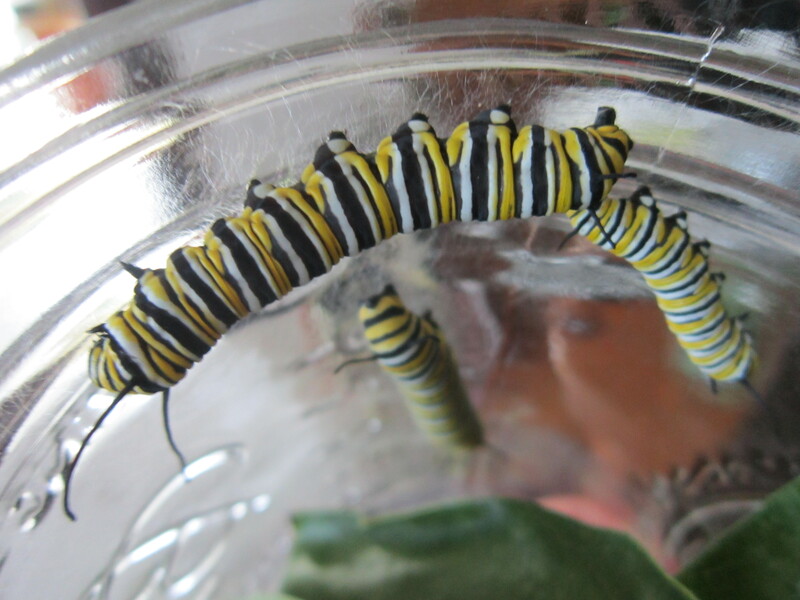 Do you usually find the caterpillars outdoors or is there a similar program to Monarch Watch that can help you find larvae? Welcome to the wonder world of the Monarch butterfly! Great story! What an interesting journal! I hope you can share it on Fat Tuesday over at RealFoodForager on Tuesdays!